Enjoy leisurely, fun holidays in a fantastic forest! Southeast Botanical Gardens is the ideal family day outing during the coming Golden Week holiday. The spacious gardens in Chibana, Okinawa city feature approximately 2,000 different kinds of tropical plants, while providing an exotic theme park that attracts families, tourists and locals. The park contains two separate areas: the Water Garden, famous for its carp ponds; and what used to be known as the Exotic Forest Garden, reopened in April as the Furafuyu-no-mori, meaning the forest of a leisurely and fun life in Okinawa. The theme of Furafuyu-no-mori is “Let’s forget everything and spend some relaxing time.” As the name implies, you will feel like slowing down your hectic lifestyle just by wandering around this forest. There is a greenhouse on the grounds in which various flowers blossom all year round. You can make kaleidoscopes, music boxes and more at a hands-on workshop. Okinawan specialties, souvenirs, mango and coconut tropical drinks and food can be purchased at vendors that look like a scene out of Southeast Asia. One interesting feature of this forest is found at the gate. Before entering, all guests are requested to exchange ¥500 for a palm coin at the booth located in front of the entrance. This has a value of ¥500 only in the forest for shopping and paying for food and drinks. You can change it back into yen when you leave if you did not use it up, or you can take it home as a souvenir. During the Golden Week holidays from May 1-5, there will be fun attractions in which guests can participate. There will be Japanese juggling with a cup and a ball, along with other Japanese games. These games are probably new to most foreigners as well as to today’s Japanese children. Kids and grownups alike can participate and have fun in the forest! Call 098-939-2555 for information. 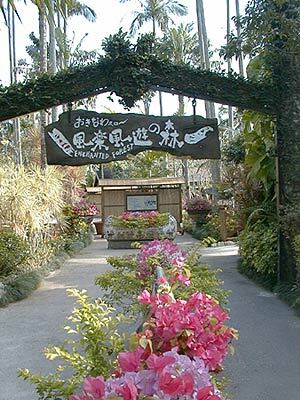 Southeast Botanical Gardens is located at 2146 Chibana, Okinawa City. It’s open 9:00 a.m.–5:30 p.m. and is open year round. Furafuyu-no-mori entry is Y500 per person.